The reporter, Daniel Kingsly of The Sacramento Sludge, later said, in tones several octaves higher than usual, that "these are the risks you take as a pool reporter when you ask a question that maybe you shouldn't have. Secretary Rumsfeld was fully justified in ripping my testicle off and I am just hoping that he will give me the opportunity to come back and thank him for my very just, very deserved punishment." That morning's press conference started normally. 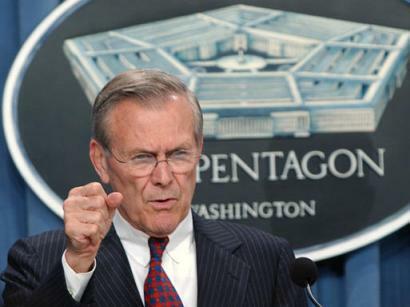 The Secretary took some simple questions regarding the number of troops stationed in Iraq and whether Rumsfeld was pleased that the POWs had returned home vefore he called upon Kingsly. Kingsly asked, "My question is twofold: First, are we really rebuilding Iraq or are we just saying that, and, second: if we dictate to the Iraqis the nature of their democratic government, that's not truly democratic, is it?" There was a pause before Secretary Rumsfeld suddenly reached into the press pool, ripped Kingsly's testicle from his body, crushed it, and held it up for the rest of the press pool to see. After Kingsly had been medically evacuated, the press conference resumed. The first question was "How does it feel to have managed such a perfect execution of Hussein's demise?"